A rapidly transforming industry sparked IMTS 2018 – The International Manufacturing Technology Show, to set all-time records for show metrics. The 32nd edition of the show drew a record registration of 129,415 people and featured 1,424,232 sq. ft. of exhibit space representing 2,123 booths and 2,563 exhibiting companies. IMTS 2018 ran from Sept. 10 – 15 at Chicago’s McCormick Place. Previous records were 121,764 registrants (IMTS 1998), 1,415,848 sq. ft. of exhibit space (IMTS 2000), 1,808 booths (IMTS 2016) and 2,407 exhibiting companies (IMTS 2016). 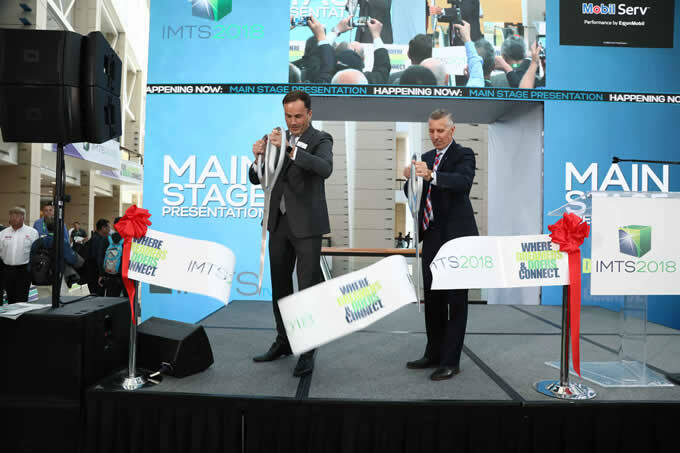 AMT President Douglas K. Woods and Deutsche Messe CEO Dr. Jochen Koeckler opened IMTS 2018. The strong partnership between AMT and HANNOVER MESSE USA helped drive record results at IMTS 2018, including 1,424,232 sq. ft. of exhibit space. Notable growth areas at IMTS 2018 included an expanded Additive Manufacturing Pavilion that featured 51 exhibitors and covered 31,550 sq. ft., the strong partnership with HANNOVER MESSE USA and its four co-located shows and 510 exhibitors, an expanded Smartforce Student Summit that drew 6,000 more visitors than in 2016. “The machines that you see at IMTS 2018 are moving at the speed of digital technology. They’re able to take files and make something that you've imagined,” says LM Industries CEO and co-founder John B. Rogers, Jr.” The tagline of IMTS 2018 says it the best, ‘Where dreamers and doers connect.’ That was the reason why we started a vehicle manufacturing company like Local Motors where we would be able to think it, print it and deploy it.” Olli gave more than 1,400 rides at IMTS 2018. “We want all visitors to be more competitive in this global world. People need to connect and collaborate,” says Dr. Jochen Koeckler, CEO of Deutsche Messe AG, HANNOVER MESSE’s parent organization. With digital technology, the pace of change makes it difficult to fully grasp the possibilities. IMTS 2018 directly addressed that issue with AMT’s Emerging Technology Center (ETC) on digital transformation, which featured demonstrations of how new science impacts manufacturing. Paul Gray, Hurco’s R&D Manager, notes that the only required connection between machines is an Ethernet cable. “Simple connectivity and software communication overcomes a major hurdle for job shops that focus on high-mix, low-volume and even custom parts,” he says. “Additive manufacturing is one of the most revolutionary technologies ever brought to IMTS, and that’s reflected in the ETC focusing on additive manufacturing,” says Eelman. ATHENA, the industry’s first voice-operated assistant, debuted at IMTS in the Makino and OKK booths, as well as in AMT’s ETC where visitors could control a 5-axis DMG Mori CNC. Index previewed its iXworld, an online portal with four distinct service areas under a single interface. FANUC’s FIELD system, an open platform that collects machine data in real time, was connected to more than 300 machines from 144 companies at the show. SAP focused on how to use blockchain to improve trust and transparency from source to consumption. After meeting at the previous show, Infor and FORCAM collaborated to create a bi-direction interface between FORCAM’S plant floor information-gathering solution and Infor’s back-end ERP solution. Fraunhofer demonstrated the first 5G network in the world, which can record data at frequencies 10 to 100 times faster than LTE. The IMTS 2018 Smartforce Student Summit broke its previous record with 23,000 registrants, 6,000 more than IMTS 2016 event. The Miles for Manufacturing 5K fun run and fundraising event on Wednesday, Sept. 12, drew a record 486 runners. The 5K run generated almost $20,000 in proceeds, which will be used to acquire a STEM kit called Bionics4Education from Pesto-Didactic and donated to 14 STEM middle schools in the Chicago area. Presentations included a seminar on the unending search for qualified labor hosted by four job shop owners. “The part of the discussion on reaching out to high school-level and community college students was good. I hadn’t thought about going to those sources to find kids interested in manufacturing,” says Aaron Collier, General Manager of Liberty Bottleworks in Yakima, Washington. EOS’ “Applied AM – Where Additive Minds Meet” half-day symposium drew more than 300 people. In a sign of how far AM has progressed, topics included a session on AM digital supply chain readiness.